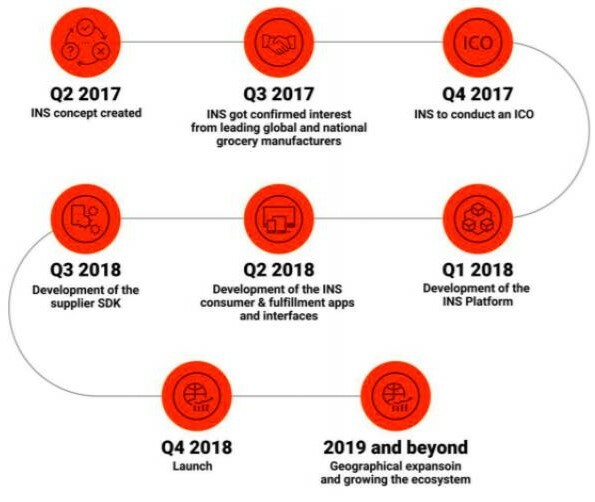 INS Ecosystem is the first decentralized ecosystem in the grocery industry using blockchain technology, which aims to directly connect consumers and manufacturers without the need of middlemen. Simply put: INS Ecosystem is a grocery marketplace and INS coin is the primary loyalty token as well as one of the payment methods. Grocery shopping is one of the largest consumer markets, which is forecasted to reach $8.5 trillion in sales by 2022 according to IGD. Online grocery is seen as the fastest growing segment that will drive the whole global market in the next 5 years, which is expected to reach $300 billion by 2020. However, this massive market is dominated by retailer giants such as Walmart, Amazon, Costco or even local wholesalers. The tremendous growth comes along with a rapid increase in global food demand and also grocery prices, which is posing two large interrelated problems: (1) abuse by grocery retailers who can dictate which products to package, price and promote & (2) ineffective trade promotions which adds more cost to consumers. As a result, consumers and manufacturers are deeply impacted in a negative way. Therefore, INS ecosystem was created to bring together producers and consumers in the grocery industry without the need of middlemen and by using smart contracts. In turn, it allows a more personalized and transparent shopping experience at low prices and better quality. While producers have full control over the prices, marketing programs and availability of their product, allowing to directly market to the consumers. The platform is a decentralized marketplace where producers can list their products for sale, running promotion loyalty campaigns, and getting feedback from customers. Consumers can buy high-quality products online at cheaper prices, which will be delivered to the fulfillment centers before assembling orders and send to consumers. The use of blockchain and smart contracts will simplify the supply chain management, allow faster, cheaper and secured transactions. Consumers can pay with fiat or cryptocurrencies (BTC, ETC) with lower fees (less than 3%) with limited access to rewards, while INS tokens give zero transaction fees and full access to rewards set by producers. 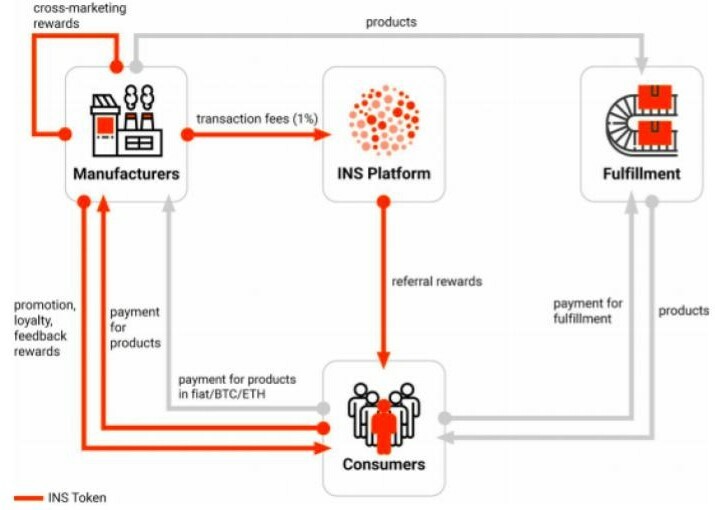 The INS token serves as a means of payment and incentives in the marketplace where producers can reward consumers for making orders, sending feedback or other interactions. Value creation to address real-world demands using blockchain technology – cheaper prices, higher convenience, better quality, more transparent and unique reward programs directly from the producers. Gained interests from top-20 FMCG manufacturers (Unilever and Mars). The project is only a proof of concept without an actual product until the end of 2018 if all things go according to the plan. The project might turn into a tokenized “pyramid scheme” which pushes products to buyers through incentive programs, thus making it a discount online shop running with a loyalty program while burning gas costs. Currently, INS has no direct competitor in this field using blockchain technology. However, they do have to face a challenging competition with traditional online retailers like Amazon Fresh. They are currently running a beta test for the platform and app interface. The roadmap is simple yet long-term. The full product will only be launched by the end of 2018 and they will start expanding and with marketing in the beginning of 2019. Although the team has experience in the Russian market, it isn’t included in their geographical expansion plan, which seems odd. Mining algorithm: token is not mined but runs on the Ethereum network. A strong team with a background in the food & grocery industry. INS’ founders – Peter Fedchenkov is a Harvard MBA and previously worked for Goldman Sachs and IBM. Together with Dmitry Zhulin, an early cryptocurrencies investor and venture capital expert, they founded Instamart – Russia’s largest venture-backed grocery delivery operator that has scaled revenue to an estimated $25m in 2008 on $10m of investment. The team also has Dmitry Khovratovich, a recognised expert in cryptography and security who designed Argon2 and Equihash. Their advisors include some renowned names such as Bancor’s founder – Eyal Hertzog, CEO of Keynote – Moe Levin and a blockchain-focused PR expert – David Wachsman. In general, the project does create value for consumers to address critical issues in the grocery industry, opening the way to mainstream blockchain technology in real-life business. Supported by the strong team who has experience and connections in the field to develop the partnership with key players is an important point. However, we do have to be cautious with some of the concerns especially the utility of INS coins, reflecting a proclaimed great value, which could turn to be a success when mass adoption occurs. At the time of publishing the USD value of the hard cap is around $45,000,000 which is currently a medium sized fundraise. This in combination with a limited token supply leaves room for future price appreciation, hence, it depends on the roadmap and progress of the project to gain partnerships with major industry partners.